This Binary Otions Strategy is based on the 1-2-3 pattern formation and three moving averages. But the secret is the how entry position with this method. Market: Forex, Commodities, Stocks, Futures. Time Frame 240 min = Expires Time 960 min. Once the indicators patter 1-2-3 draws on your chart Buy Arrow, entry long position on the retracement at the level of 5 Exponential Moving Average (gold line). Once the indicators patter 1-2-3 draws on your chart Sell Arrow, entry short position on the retracement at the level of 5 Exponential Moving Average (gold line). Exit at the exipres time. 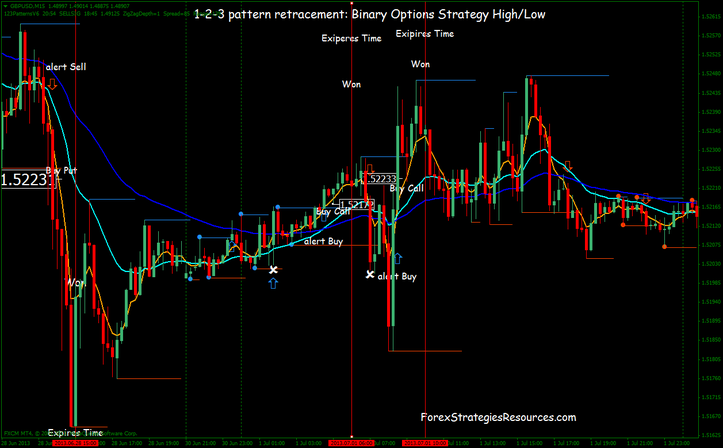 The Entry position on the retracement with 1-2-3 model is a great idea because, it is an optimization that makes pips gain are those that make the difference. This is a great advantage on the profitability. 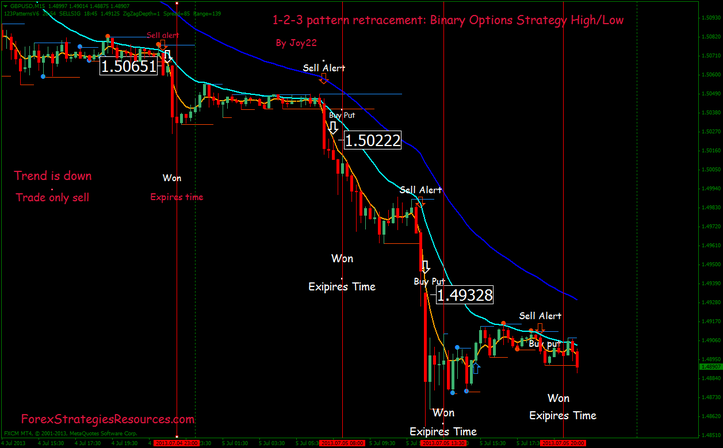 This Binary Options Strategy is good also how Trading System for all . In the pictures below Binary Options Strategy High/Low: 1-2-3 pattern with Retracementin action. It doesnt work. When you take the 123 Pattern v.6 or activate the Template, Metatrader will freeze and you must Close it. The indicator requires Zig Zag indicator. Check the zig Zag version.